Ambassador’s House staying true to its name was the home of the Bangladeshi Ambassador for several years before it became open to the public as a holiday home. 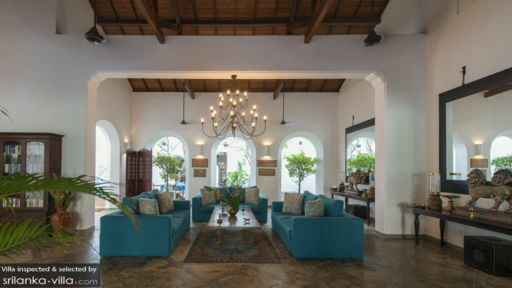 Located near Galle, a historical city in Sri Lanka, the stunning property features colonial architecture with whitewashed interiors and exterior along with columns and pillars, as well as a wooden ceiling. Enjoy a wonderful holiday with friends and family as you spend time exploring the city with its historical fortress or lounging beside the pool under the clear, blue skies! The villa features five bedrooms, each designed with a unique colonial design accentuating the historical past of the property. Four bedrooms are furnished with king-sized canopied beds and the fifth with single beds. The rooms are air-conditioned and exude a comforting aura to make you feel at home immediately. For additional sitting, the bedrooms have a two-seater table or a lounge chair where you can relax with a good book. The bedrooms come with en-suite bathrooms that have been fitted with all modern amenities including showers, dual basins, and/or a walk-in shower area. Along a stone deck with grass peeking through its edges is the 12-metre swimming pool that runs the length of the villa. With verdant greenery around it, the pool area is truly remarkable with its quiet and calm ambiance and an atmosphere that is pure and relaxing. As you swim around or take a dip in the cool waters, feel all your worries leave your body. Lie back on the sun chairs as you soak up some tropical sun or enjoy a cup of hot tea on the outdoor seating area beside the pool. Since the main pavilion opens to the pool, you have a large open area that can be enjoyed with everyone all at once. A luxurious and truly opulent living area awaits at the Ambassador’s House, one that is fit for royalty. A traditional ceiling, white archway, antiques, and large mirrors complete the space along with large open arches leading outdoors and providing ample natural lighting. The aquamarine couches are plush so you can fall back and take a breather when you want. Spend time catching up with loved ones in this private and cosy space. A media room is situated beside the pool, made like an alcove with a curved sofa and a flat-screen TV! The dining area is found next to the seating with a colonial, dark wood eight to ten-seater dining table for guests to enjoy feasts. Upstairs another sitting area is found outdoors on the veranda from where you get excellent views of the property! A lounge area can also be found on the terrace where you either sunbathe or simply doze off in the afternoon. Generous staff at Ambassador’s house will cater to all your needs and requirements to ensure you have the best stay. They are skilled at preparing delicious local and international feasts for guests, on special request and charges extra. A daily breakfast is included in the stay to start your day off with a power-packed meal! The villa is situated in a picturesque location along the coast where you can head to the beach with much ease. 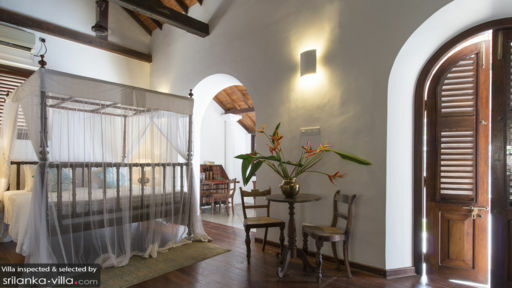 For recreation, pay a visit to the historical Galle fort, a UNESCO World Heritage Site. Explore the many restaurants, bars, and cafes in the area including The Living Room, Pilgrims Lounge, Fortaleza, and many more! We were in Sri Lanka for a wedding and stayed at the villa with a group of school friends, 5 couples from all over the world. The villa was absolutely perfect. Amazing staff, clean and comfortable, lots of space, a perfectly formed pool, wonderful breakfasts... Thank you, thank you! We stayed 2 night in this super villa. The house was very spacious and comfortable. Rooms tastefully furnished, clean and comfortable. The staff was excellent. We ordered our food for each meal, the staff shopped for what ever was needed and produced a good meal. Location was very good. Lots of shops around. Only thing we missed was a beach especially for the kids. Located in the fort, the house and staff is great. All meals are prepared well prepared, house and grounds are well maintained. Highly recommended! From the moment you enter The Ambassador's House, you know you have made the right choice. 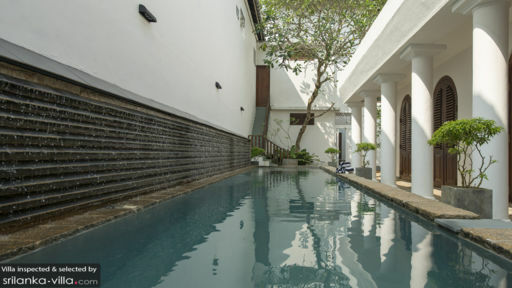 Located in the heart of Galle Fort, the villa is luxurious without being overwhelming and the staff are attentive without being overbearing. The meals prepared by the resident chef are fantastic, whether it's breakfast (which is included in the rental price) or any of the dishes available from the extensive menu for lunch and dinner (you pay for the ingredients and then leave the rest up to the chef). Overall, a brilliant experience and highly recommended.